Today is Halloween. All the pancreases the country over, in particular those encased inside younger bodies, are cowering in fear. All that sugar, aiiieeeeee. If they could run away screaming, they would. As it is they are hiding behind the stomachs, clutching their blankies and whimpering. 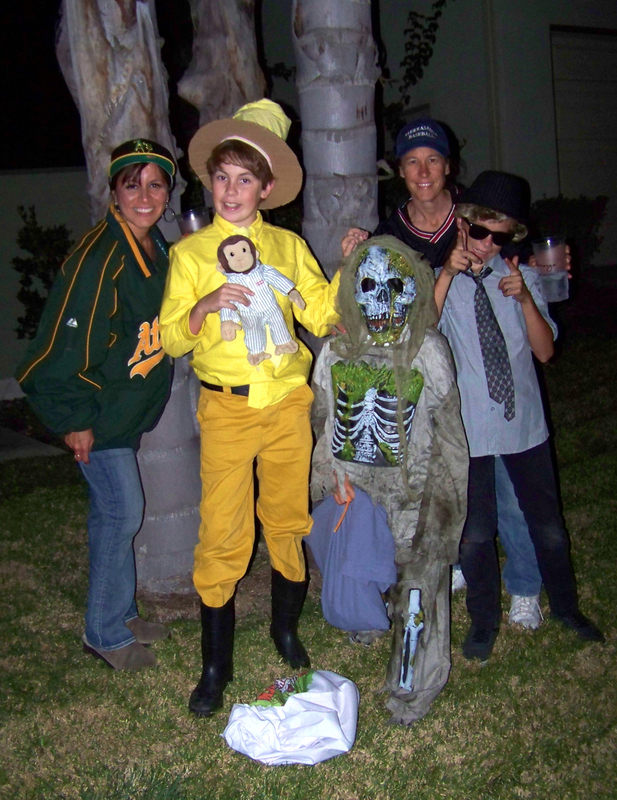 But Halloween is so much more than candy. Here I have listed a few of the wonderful ingredients we have included in our Halloween this year, to make it extra special. 1. 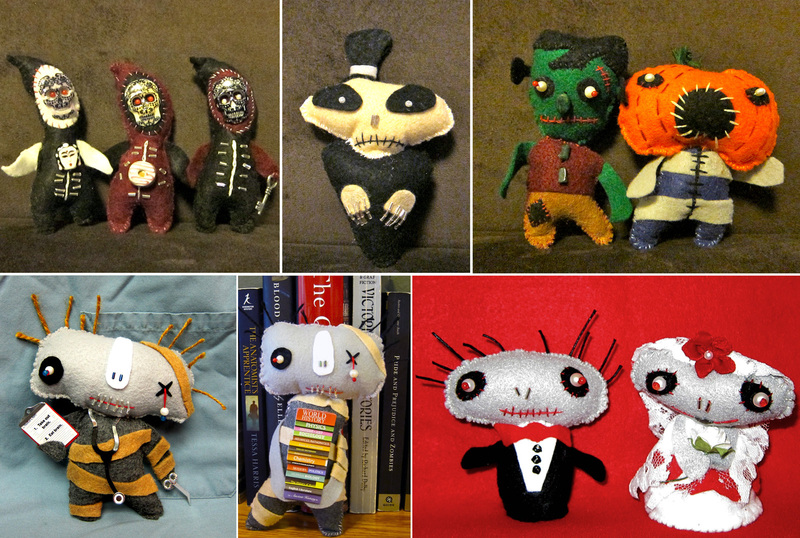 Obsessive sewing of spooky Halloween dolls. I bought the book Zombie Felties and have been having fun sewing patterns from that book and making some of my own. I modified their zombies into a zombie doctor, librarian, and bride and groom. 2. 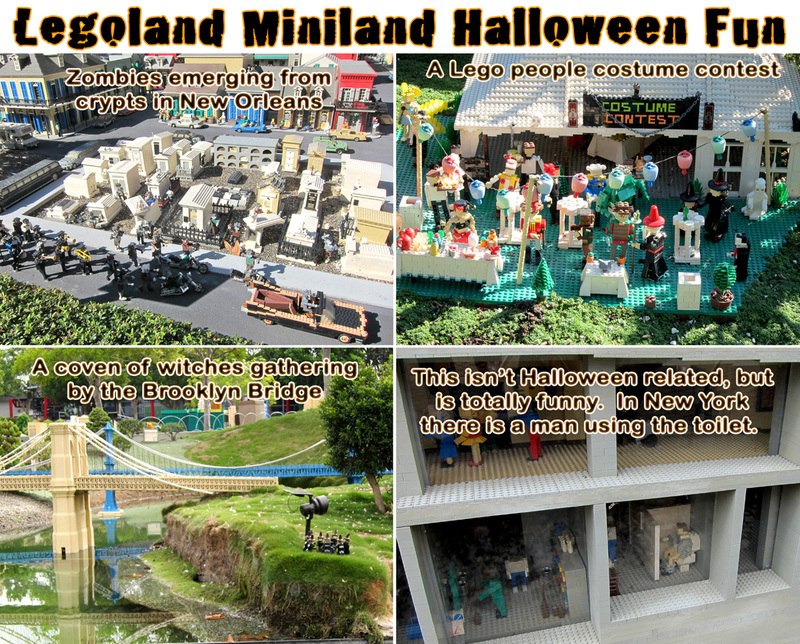 A visit to Legoland, even though the kids are little old for Brick or Treat. Our front yard was invaded by crabgrass, so I dug it all up. Just in time to put up a spooky graveyard. Always be careful to leave a plate out for the zombies, so they don’t eat you. Or any stray kids. 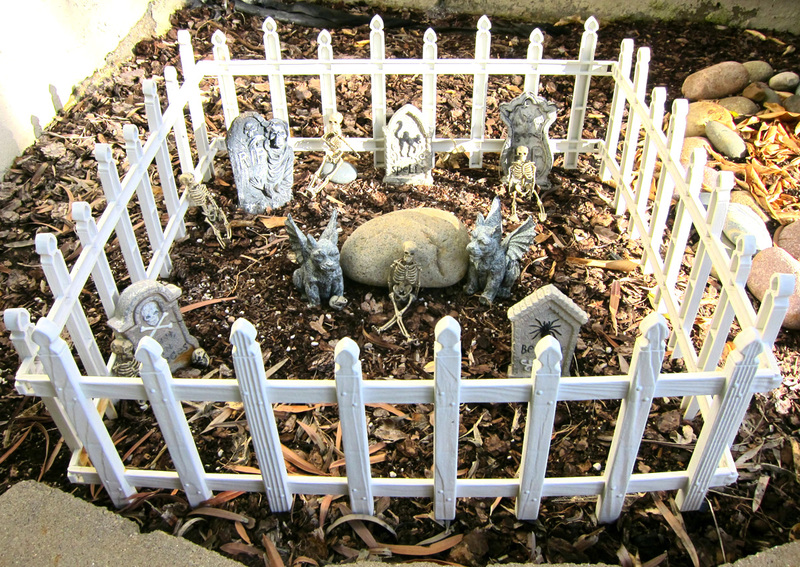 You can’t have too many graveyards on your property for Halloween. 5. 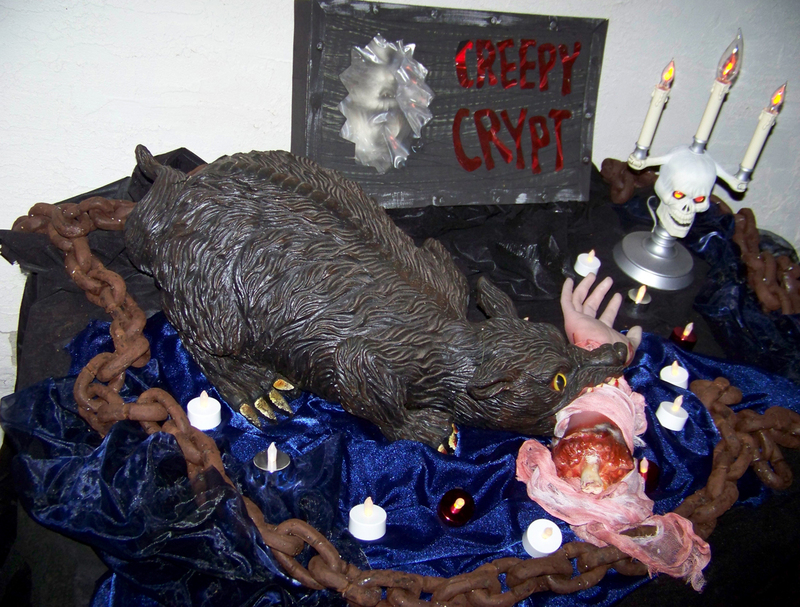 An amazing mini haunted house. 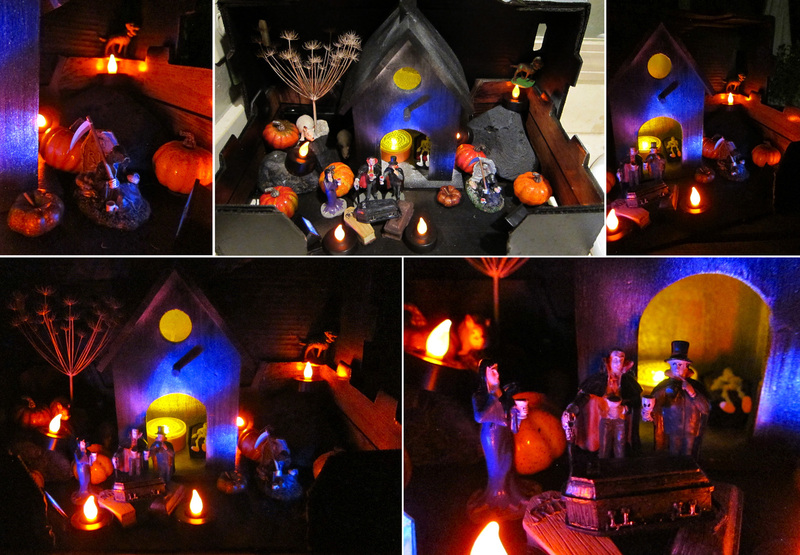 I made this tiny haunted house out of two fruit boxes, a little wooden house that I spray painted, small figurines, coffins, and pumpkins, and votive candles. Yes, more mini stuff. I like little things. See two of my other posts for more little things! Turning an Antique Printer’s Drawer into a Tiny Shelf of Wonders and Microworlds. The kids are older this year, so no more pirates or fairies. 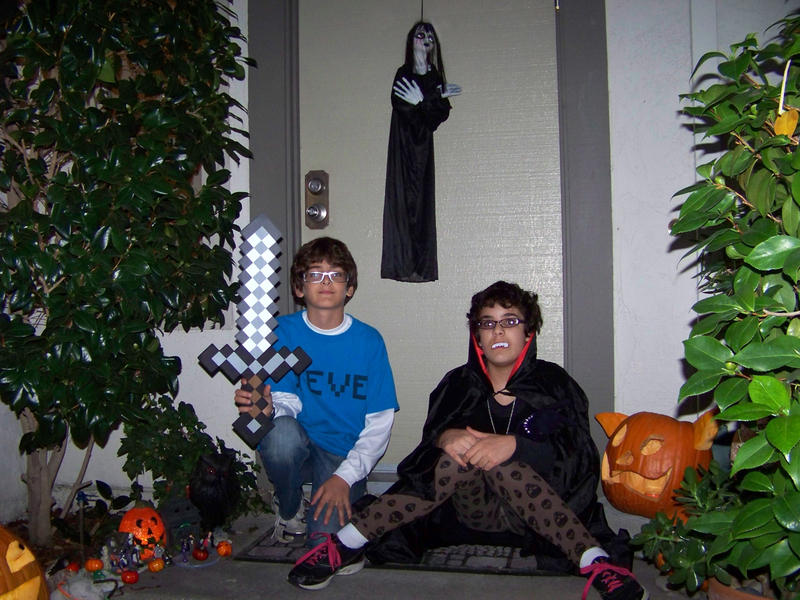 The kids went anime this year. Sam is Edward Elric from Full Metal Alchemist and Emma is Road Kamelot from D. Gray Man. I also got to dress Trevor as the Director of the Centers for Disease Control. 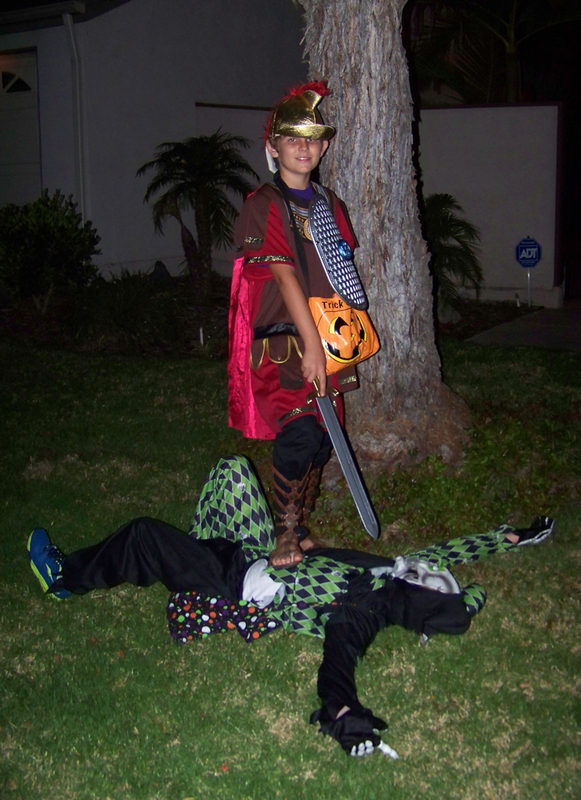 He is covered in giant germs, including, of course, ebola. Down in the bottom corner we have Sam again, J.D. 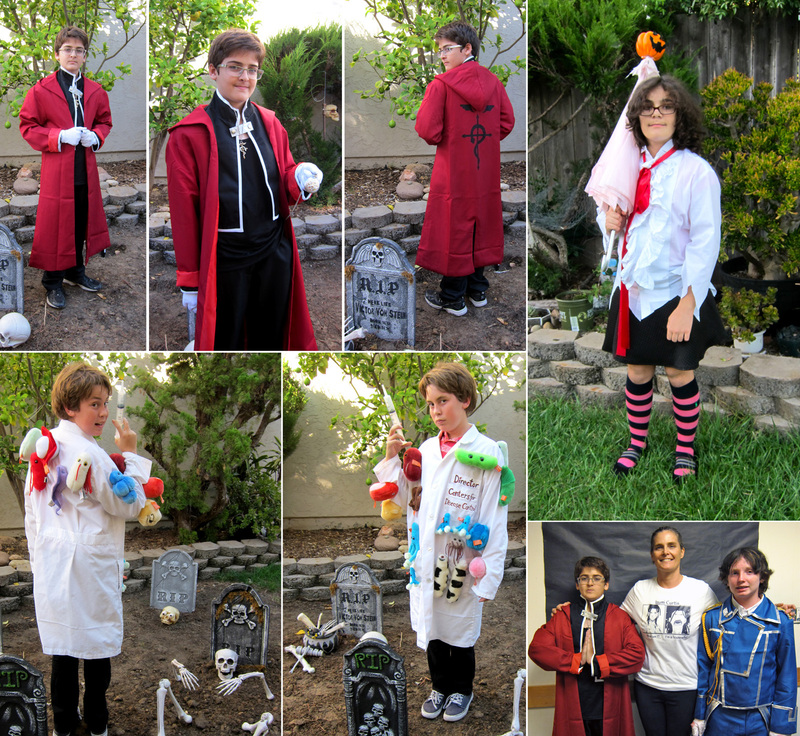 as Roy Mustang from Full Metal Alchemist, and I am wearing a tee shirt I made with Izumi Curtis on it. 7. Finally, of course, Pumpkins, the orange heart of Halloween. 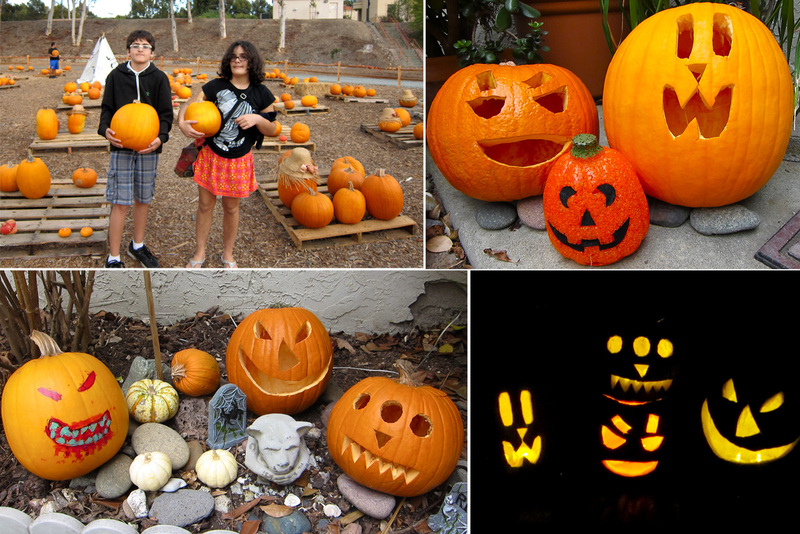 Kids are never too old for a pumpkin patch, or for carving pumpkins. Emma paints one of hers every year, it was particularly evil looking this year! In a few hours we will be heading out for the annual ritual of trading the candy I bought for the candy that our neighbors bought. 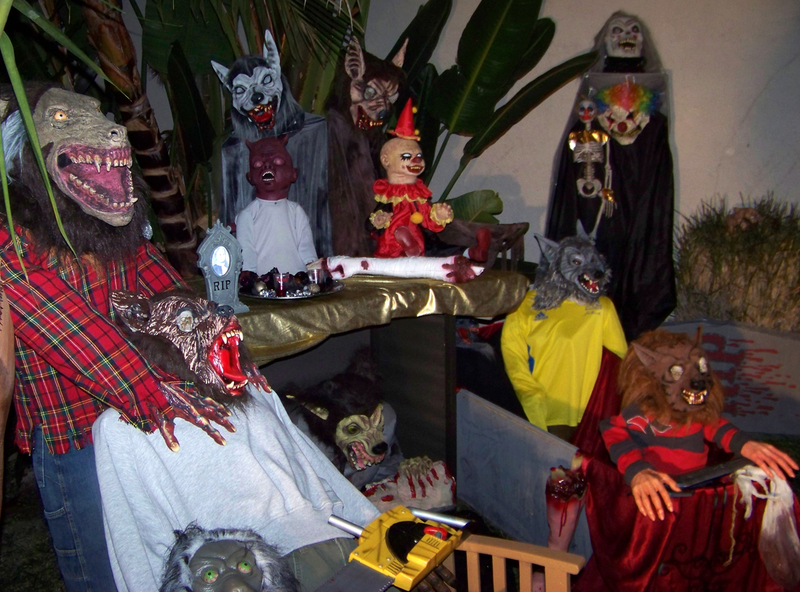 We will check out the Kalal’s haunted house down the street, and will go around the corner to see how insane the crazy people who rent out a storage unit to store all of their decorations have gotten this year in doing up their house and yard. 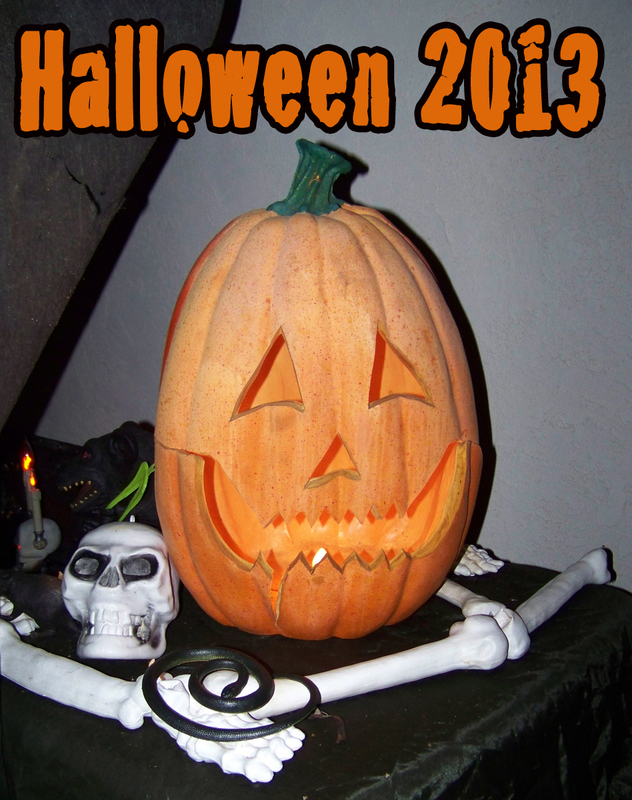 HAPPY HALLOWEEN TO ALL!!! p.s. Be kind to your pancreas. Put down the Tootsie roll. 10 is enough. I don’t know how many times I have answered that question over the past two weeks. 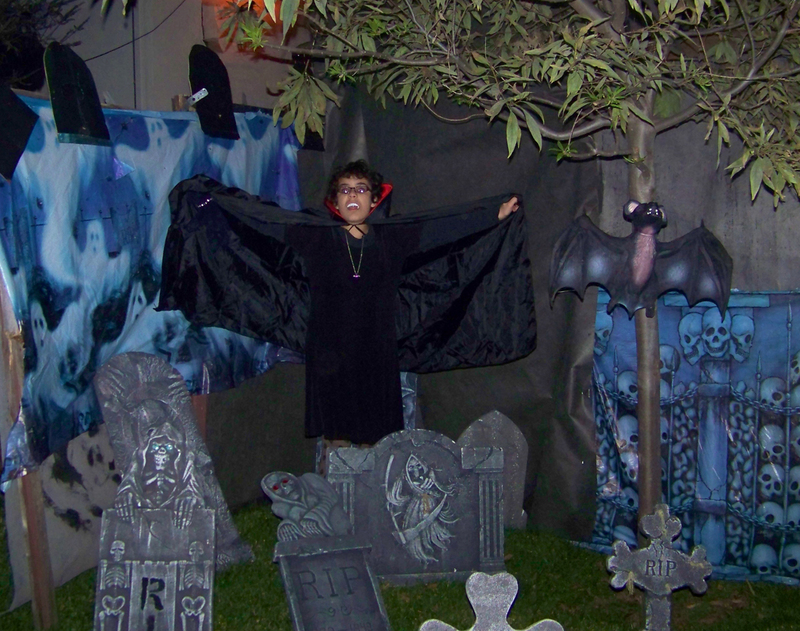 My daughter Emma has been very excited about Halloween. The candy. Her vampire costume. Running around at night. Well, the countdown is over, along with Halloween. At least until next year! 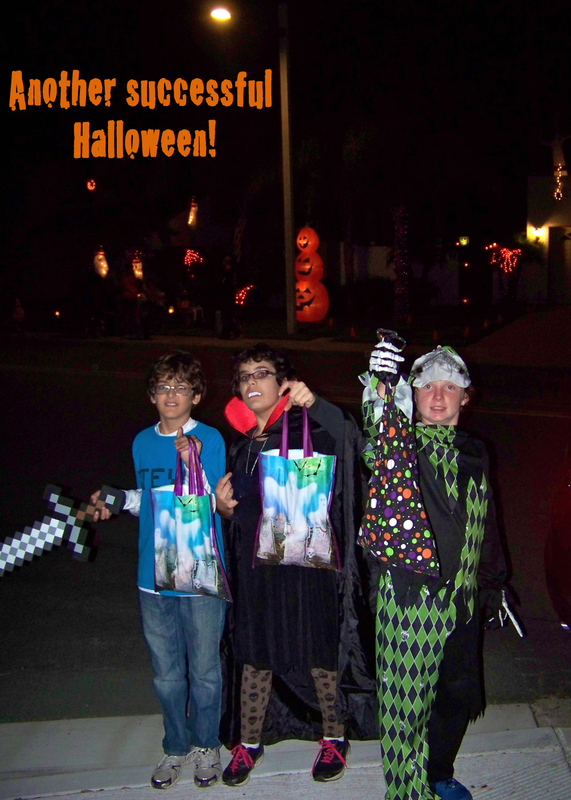 Check out the photos of our night of trick or treating in Tierrasanta. 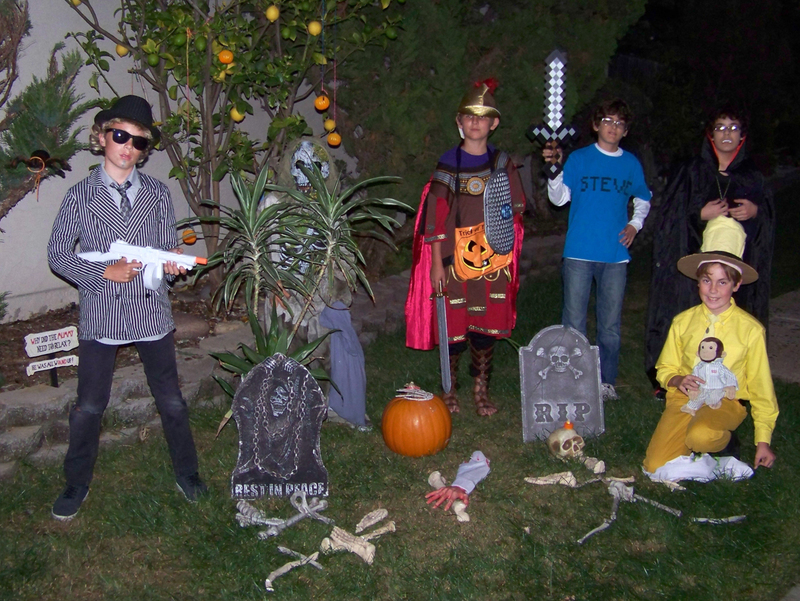 We got together a gang of kids and went up and down and around our street. 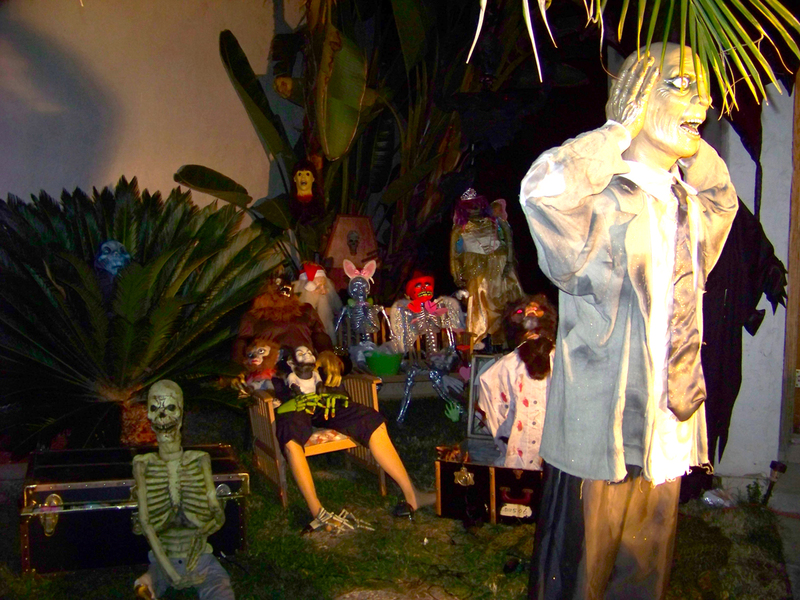 We stopped at the Haunted House that Doug puts up at the end of our street. 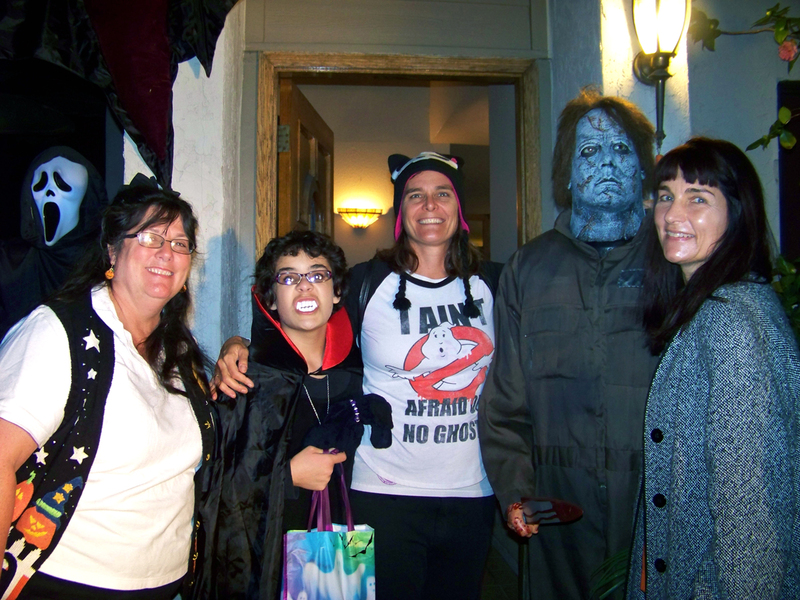 We stared in amazement, as we do every year, at the Crazy House around the corner. 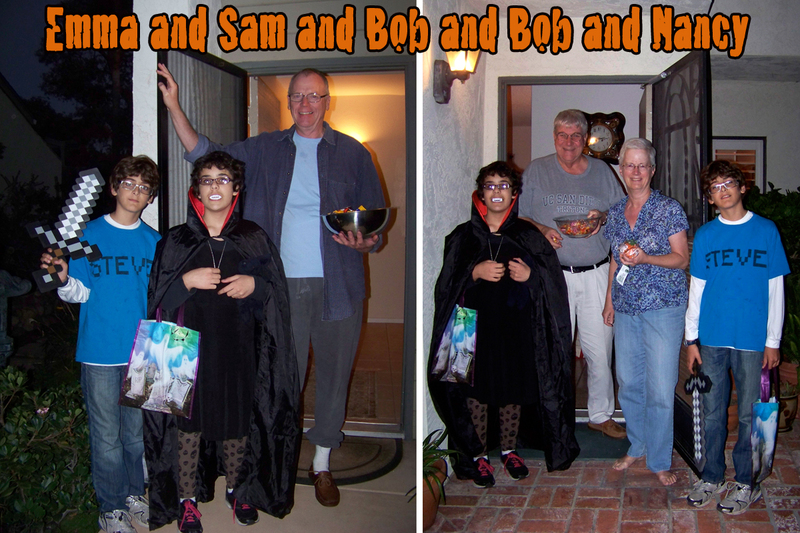 The kids are old enough that the adults get to chat and catch up, while the kids collect their candy. They are even old enough now not to whine at how heavy their bags are! Ahh, these truly are the salad days. M+M and Laffy Taffy salad that is! Emma and Sam in our traditional “Sit in front of the door picture” that always starts out our night. 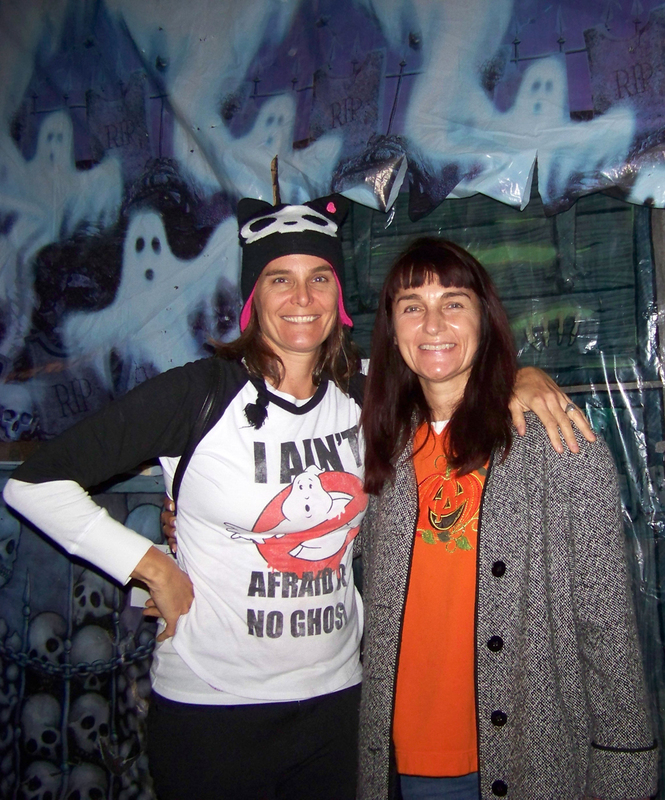 Mo and Leslie at the door of the Haunted House! Rat having dinner. Funny, Doug didn’t offer US dismembered limb. All we got was candy. 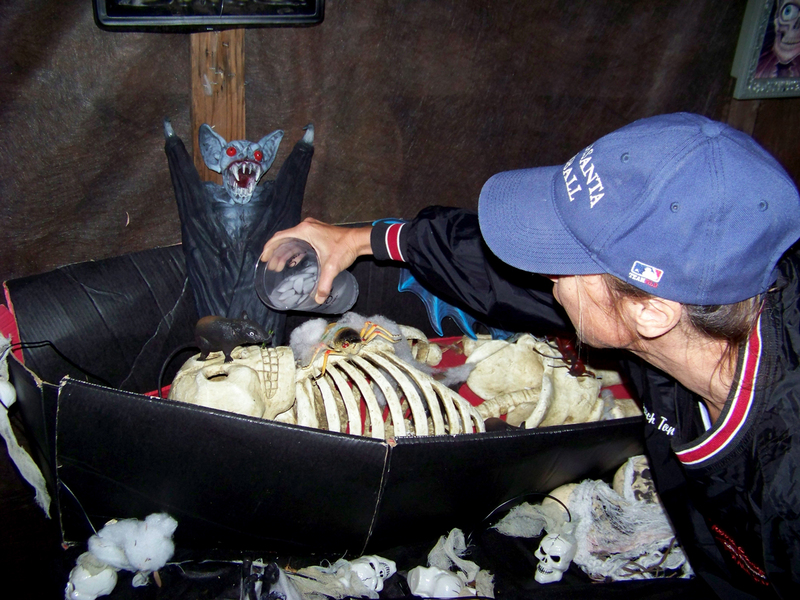 Annie tries to resuscitate the guy in the coffin. She said this ALWAYS works with Tony. 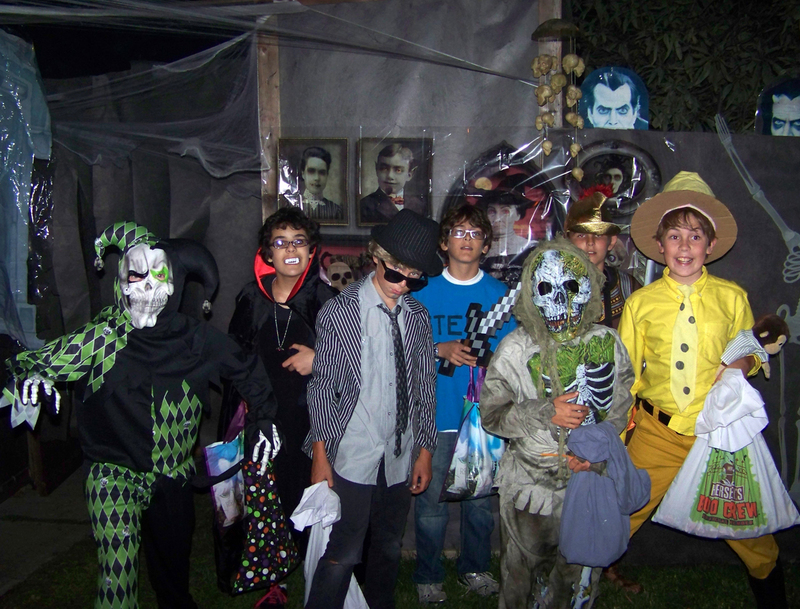 Kids inside the Haunted House. Dropping spiders, and shaking trees, and grabbing hands, OH MY! Half of our gang departs, off to chocolatey-er pastures. 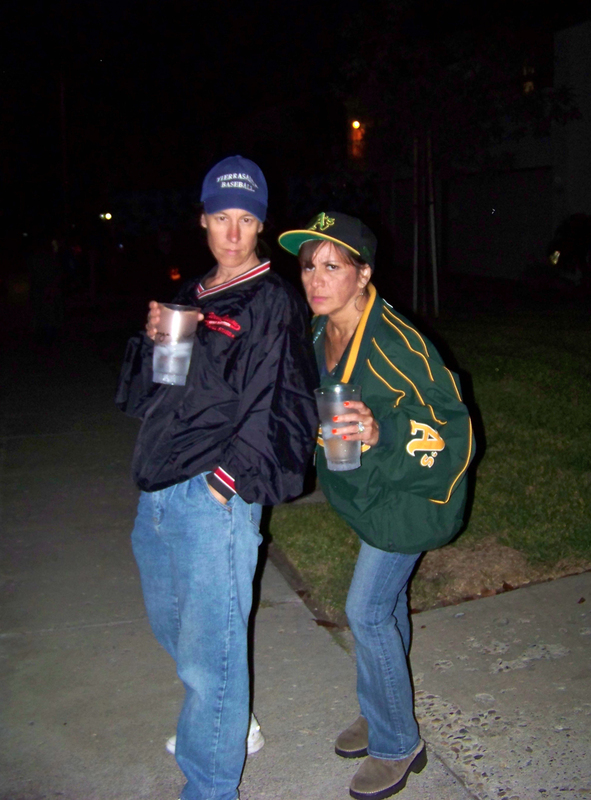 …while we head around the corner to the Crazy House. 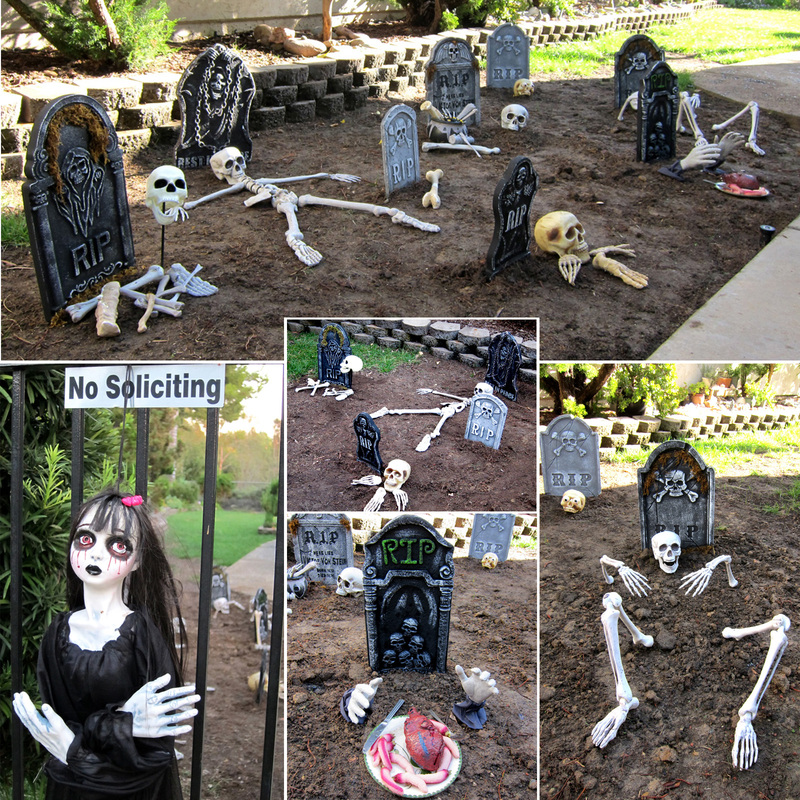 These people LOVE Halloween, and their decorations are beyond belief. Before we head in Blake tries to kill J.D. All the decorations must be getting to him. 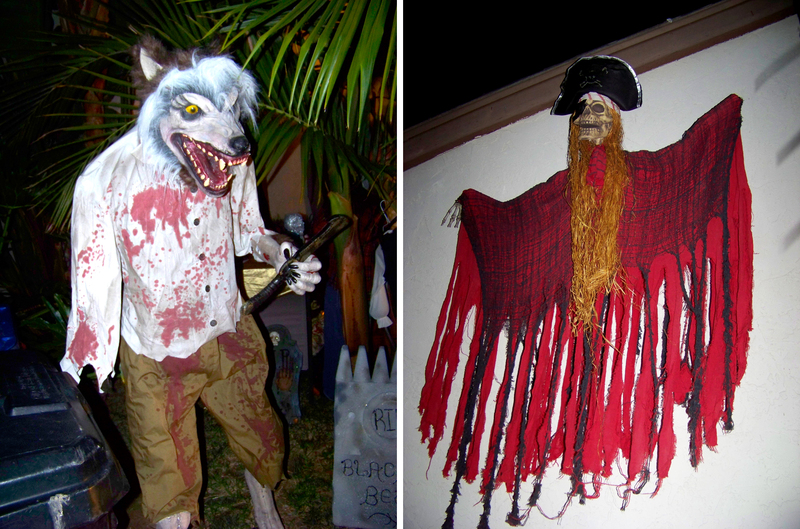 Bloody werewolf and hanging pirate ghost. Just hanging out at the Crazy House. Gal pals and psycho killer guy.